The Mexican business elite has entered fully into the electoral campaign. The clash with the favorite in the polls, Andrés Manuel López Obrador, is in its wildest form less than two months before the presidential elections. The top executives consider that the arrival to power of the leader of Morena will mean a break with the current status quo and will be harmful to the Mexican economy and, therefore, to their interests. The uncertainty among businessmen has been increasing as López Obrador (the candidate of Juntos Haremos Historia, an electoral umbrella that includes Morena and the Labor Party - both from the left), and the Partido Encuentro Social, from ultra-right) was consolidated at the top of the polls and Ricardo Anaya (who heads a coalition of center-right, center-left and center parties) was slow to detach himself from the third in contention, José Antonio Meade (PRI, today in the Government). The goal is to reach June with the possibility of reversing the polls and monopolizing the useful vote of those who do not want the victory of the leader of Morena, as revealed by conversations with the ten directors consulted, on condition of anonymity. The strategy of the big businessmen is to strengthen a current of opinion contrary to López Obrador, insofar as their capacity to influence workers is not that of past eras. "Business as a boss does not influence that much anymore", admits one of the sources consulted, in tune with Anaya's close advisers. In the campaign of the reformist politician - the one who has spent the most money - they want business support, although they assume that per se they cannot reverse an election. In recent days, the belligerence of the leader of Morena against a bunch of businessmen -among them the first executive of Cinépolis, Alejandro Ramírez- has provoked the response of the Mexican Business Council, which has denounced "the" insulting and slanderous expressions" about some of its most prominent members. The Coparmex, which brings together 1,600 companies, and the Business Coordinating Council, the employer's association, have also shown their support for the text. 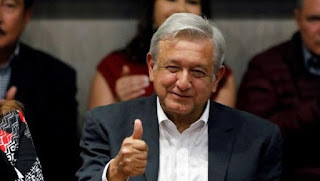 In full escalation, the Mexican Business Council reminded López Obrador that the private sector generates 90% of the formal jobs in the North American country. However, a good part of that figure - almost eight out of every 10 workers - are on the payroll of small and medium-sized companies and not of large corporations. López Obrador has guaranteed, in face of his critics’ attacks, that his economic policy does not contemplate expropriations, that he will respect the autonomy of the central bank and that he will not raise taxes. He has said he is committed to reduce the power that until now have had the big businessmen in Mexico, a country crossed by poverty, where more than 50 million people, almost 44% of the population, live in a situation of scarcity. However, we all know through various examples in the continent, that taking matters so radically with businessmen might not be a smart choice. The big businessmen, on the other hand, feel that the period between the second and the third debate - May 20 and June 12 - will be a turning point to gauge Anaya's chances of victory. In case that the distance with López Obrador is not reduced, most them would certainly assume the need of an approach with the leader of Morena to try to iron out the tensions in the case of an eventual victory.